One of the main reasons to visit South Africa and other African countries is to go on Safari. The word ‘Safari’ conjures up different images for different people. 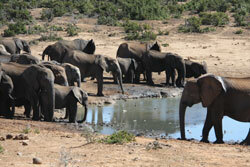 It is definitely the enjoyable and sometimes exciting search for wild animals in the bush. It can be undertaken on the back of a truck with a large group of people, in a Land Rover or in your own vehicle if the roads are good enough. South Africa offers national parks such as the Addo Elephant park or the Kruger National Park where visitors have a choice of their own vehicles or the game park’s vehicles and organised excursions. These are accompanied by a knowledgeable ranger who knows where it is most likely to find various animals and can identify them for you. The Addo Elelphant Park recently overtook the Kruger in visitor popularity, possibly because it is nearer Cape Town; the airport most people fly into. There are also plenty of private game reserves where expeditions are organised to give visitors a good day out or more with numerous sightings. One of the really nice things about driving in the South African countryside is that you do spot wild animals outside the game reserves. Baboons and ververt monkeys are often seen near grass verges, as are wart hogs, mongoose, various types of deer and birds of prey soar in the skies above. Accommodation can be booked either in the game parks with the accompanying sounds of animals at night. This ranges from good comfortable basic to luxurious with prices to match. Alternatively, there is plenty of self-catering, bed and breakfast and hotels just outside game parks or within driving distance.